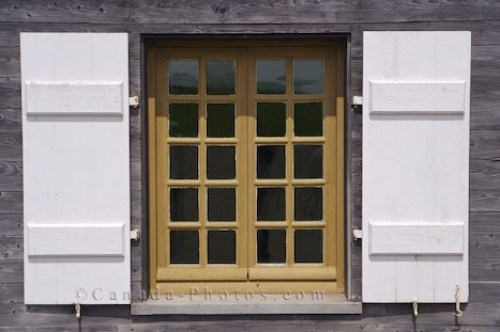 Shutters painted a bright white, remain open to display the old styled windows on a cottage at the Fortress of Louisbourg in Cape Breton, Nova Scotia. These windows are part of the decor of some of the buildings throughout this National Historic Site that is open to the public to explore. Cottage windows at the Fortress of Louisbourg, Louisbourg National Historic Site, Highway 22, Fleur de lis Trail, Marconi Trail, Cape Breton, Nova Scotia, Canada. Picture of unique windows on a cottage at the Fortress of Louisbourg in Cape Breton in Nova Scotia, Canada.